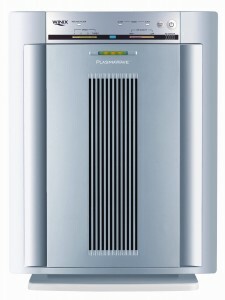 Winix has gained a high reputation for its exceptional value, and this Winix PlasmaWave 5300 Air Cleaner Purifier is no exception. If you are looking for an air purifier which allows you to sleep well at night and experience relief from your allergies, then this Winix PlasmaWave 5300 Air Cleaner Purifier is worth considering. Featuring a PlasmaWave Technology, this Winix WAC5300 True HEPA Air Cleaner combines the best air cleaning technologies to capture all of the unseen particles suspended in the air. The HEPA filter is capable of removing 99.97-percent of particles as small as 0.3 microns in size. Then the carbon pre-filter collects any volatile organic compounds and odors. The Plasma generator is responsible for getting rid of any airborne pollutants at the molecular level. Additionally, this Winix PlasmaWave 5300 Air Cleaner Purifier comes with a remote control, allowing you to adjust the settings whenever you want. You can store the remote on the top of the unit. Works efficiently through a three step purification system, removing indoor pollutants and odors for healthier living. There are no ozone or harmful by- products produced. Ideal for large spaces; certified for rooms up to 350 square feet. Built-in air quality sensor is able to adjust fan speed automatically. Energy Star approved; 1-year limited warranty. It does not emit ozone or any other dangerous by-products. It looks fairly nice and operates quietly especially in sleep mode. Feature HEPA filter and carbon pre-filter for odors. Energy Star approved, save your money. This unit is a little bit large and takes up a bit more space. It sometimes produces a very slight high-medium pitch noise.